Many hospitals in the United States employ overnight intensivist coverage for their medical intensive care units, but little is known about the effect of this staffing model on trainee education, and the learning that occurs overnight. This study examined the educational interactions occurring between residents and overnight intensivists in the context of the overnight multidisciplinary learning environment. We conducted an anonymous, cross-sectional survey of internal medicine residents and overnight intensivists at a single, tertiary academic teaching hospital regarding teaching impact, teaching frequency, educational needs and learning preferences when working overnight. Of those surveyed, 61% (33/54) of residents and 56% (15/27) of intensivists responded. Residents identified overnight intensivists as having the highest teaching impact overnight, followed by co-residents, respiratory therapists, then nurses. Residents reported learning most about ventilator management (87%), procedures (70%), and vasopressors (67%) overnight. Overnight intensivists reported teaching most about ventilator management (100%), procedures (83%), and running a "code blue" (67%). Residents favored teaching that is procedural (78%), topic-specific (75%), and delivered in a one-on-one setting (63%). Residents identify the overnight intensivist as an impactful teacher. Other providers working in the intensive care unit overnight also contribute to resident education. Further study is needed on the educational roles of other multidisciplinary team members. There is opportunity to tailor overnight education both in content and style to suit learners' needs. Due to recent recommendations from major national organizations, including the Leapfrog Group and the Society of Critical Care Medicine, critical care staffing in the United States has trended toward increased utilization of critical care specialists [1,2]. As a result, approximately 41% of United States hospitals employ continuous on-site faculty coverage in their intensive care units (ICUs) . This mirrors practice in Europe and Australia, where high-intensity intensivist staffing is common , and contrasts with recent data from Canadian hospitals where only 15% have an ICU physician in-house overnight . Although studies show inconsistent mortality benefits with this model [4-7], the ongoing presence of an overnight intensivist (OI) impacts trainee education [8,9] and likely patient care, although results are inconclusive. One recent study showed that the presence of OIs improved residents' educational experience , while another correlated presence of an OI with residents perceiving significantly less autonomy and more supervision without difference in reported learning opportunities . Outside of these studies, there is a paucity of data about overnight learning in the medical intensive care unit (MICU), particularly regarding what topics residents learn, how they learn them and by whom they are taught. Furthermore, the impact that different types of medical providers, such as nurses and respiratory therapists, may have on resident education is not well elucidated in the current literature. Therefore, the goal of this study was to characterize the educational interactions occurring between residents and OIs in the context of the multidisciplinary learning environment overnight. We conducted an anonymous, cross-sectional survey of internal medicine (IM) residents and OIs at a single, tertiary academic teaching hospital. Separate surveys for residents and OIs were developed based on review of the literature and iterative modification by a resident and critical care faculty. Questions were revised after cognitive interviewing and pilot testing by participants outside of the target audience (e.g., faculty not affiliated with the study institution and residents outside the study population). Final surveys (available in the Supplementary Material 1 and Supplementary Material 2) included questions about perceived educational needs, topics taught overnight, multidisciplinary interactions, learning preferences, and general comments. A 20-question survey was distributed to all senior IM residents. A 9-question survey was administered to MICU faculty who had worked overnight within the past three months (i.e., OIs). Surveys were disseminated during the 10-month study period in August 2016 via the Qualtrics platform (Provo, UT). Both residents and intensivists were incentivized to complete the survey by entering into a raffle for a local restaurant gift card. This project was deemed an educational quality improvement project and thus, not human subjects research by local institutional review board review. Of 54 eligible residents, 33 responded to the survey (response rate = 61%) and 15/27 intensivists responded (response rate = 56%), including partial respondents. Characteristics of the participants are shown in Table 1. Of residents surveyed, 76% (23/30) believed that OIs did not have an obligation to teach, and 83% (25/30) of residents did not expect teaching overnight. In contrast, 93% (14/15) of OIs identified teaching as part of their overnight duties, although 87% (13/15) responded that there was not enough time to teach overnight. Residents reported learning the most about ventilator management (26/30, 87%), procedures (21/30, 70%), and vasopressors (20/30, 67%). Residents felt least comfortable with neuromuscular blockade (21/30, 70%), ventilator management (20/30, 67%), bedside ultrasound (19/30, 63%), and running a "code blue" (19/30, 63%). Intensivists reported teaching most about ventilator management (100%), procedures (10/12, 83%), and running a "code blue" (8/12, 67%) (Figure 1). Residents rated OIs as having the highest teaching impact overall (5.5/6), followed by other IM residents (4.5/6), respiratory therapists (3.9/6), nurses (3.5/6) and others (Figure 2). When residents evaluated which providers taught most often (always or most of the time), they selected OIs as teaching most frequently overall (14/30, 46.7%), followed by other IM residents (11/30, 36.7%), respiratory therapists (4/30, 13.3%) and nurses (3/30, 10.0%) (Figure 2). Comparing the impact of teaching with the frequency of teaching revealed three distinct provider groups: high impact providers who teach frequently (OIs, other IM residents), high impact providers who teach infrequently (respiratory therapists, nurses), and lesser impact providers who teach infrequently (other attendings, other providers). 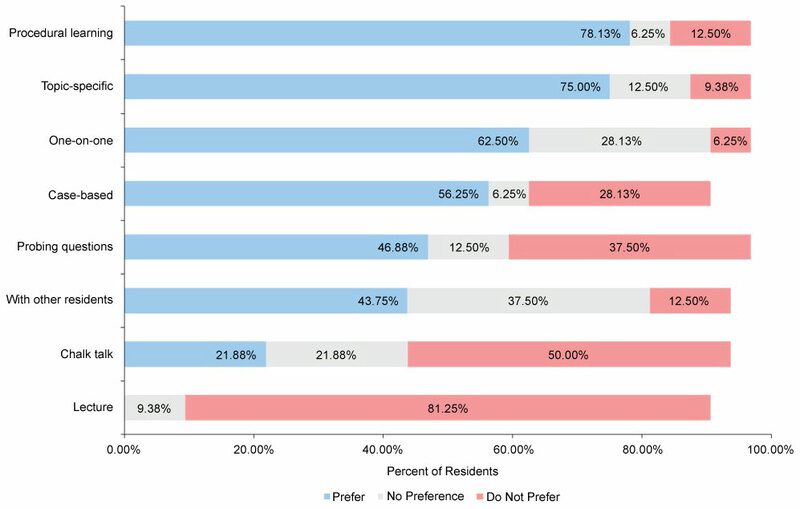 Overall, the majority of residents favored teaching that is procedural (25/32, 78%), topic-specific (24/32, 75%), and delivered in a one-on-one setting (20/32, 63%). No residents preferred lectures overnight, and half did not prefer chalk talks (16/32, 50%). Residents were divided (47% prefer, 38% do not prefer) on the use of probing questions as a teaching technique (Figure 3). In this study of residents and OIs, we found that the OI is both a frequent and impactful teacher relative to other providers. At our hospital, on a given overnight shift, the OI is responsible for all new admissions and approximately 30 existing patients spread across two MICUs and one mixed medical-surgical ICU. These three units are staffed by a total of three residents and two interns. Despite this heavy workload (indeed, 87% (13/15) of OIs agreed that there was not enough time to teach overnight), residents frequently praised their experiences with the OI (e.g., "I think the attendings are great about being available to help when needed" and "overall...the experiences I've had have been very positive"). We believe these findings highlight the educational role of the OI, and underscores the importance of overnight teaching, even if abbreviated. A recent survey of Pulmonary and Critical Care fellowship directors regarding resident critical care education showed frequent use of bedside teaching, case/topic discussions and didactic lectures, with the majority of teaching occurring during ICU rounds . Though this study did not address nighttime learning, our results showed that residents have preferences for overnight teaching styles which may not be utilized on daily rounds, such as procedural teaching or one-on-one discussions. Residents also identified subject areas which may be used to inform the focus of nighttime teaching. However, what residents perceive as their knowledge deficiencies is not always mirrored by teaching effort from OIs. Our study suggests that there are areas for which educational needs are not met, such as bedside ultrasound and neuromuscular blockade. The opposite is also true: there are also topics and/or skills identified by the OI in which residents may not be cognizant of their educational needs (e.g., family/patient communication). Other providers play a significant role in the overnight learning environment, specifically other IM residents, respiratory therapists, and nurses. The discovery that nurses are less frequent, yet impactful teachers was surprising to us. This may be related to trainee perception of nurses as a source of local expertise, or limited nurse staffing overnight as compared to the daytime. Prior studies have demonstrated that simulation training with multidisciplinary pediatric ICU providers can improve performance during real events, suggesting non-MD providers can impact resident learning . Effort should be directed to emphasizing the skills and educational role each multidisciplinary provider has in the MICU. Indeed, if non-intensivist practitioners also facilitate meaningful education in the ICU, this has important implications for teaching hospitals not utilizing a 24/7 intensivist coverage scheme. Alignment of educational needs and teaching efforts is important as more hospitals move to a shift-work model for intensivists, and in a time of evolving duty hour restrictions for house staff ; under these conditions, one often loses a longitudinal teaching connection between the faculty member and resident. Indeed, a 2015 study showed that in a 16-hour call model, residents reported perceived reduction in attendance at didactic teaching sessions, reduced self-directed learning, and some decrease in procedural opportunities . Therefore, to maximize educational synchrony (i.e., what needs to be learned is both taught and learned), it is necessary to customize teaching toward resident needs, and deliver the content in a preferred and effective style. Next steps from this research include development of an overnight ICU teaching curriculum tailored toward these identified learning needs. Our study was limited by a small sample size at one institution. Our response rates to the surveys, although both over 50%, are modest. Since the survey was intended to characterize education overnight in the intensive care, something that all internal medicine residents and OIs have experience with, we do not think there is a substantial difference between responders and non-responders. We believe that survey fatigue likely played a role in the poor response rate of the residents, as residents are an over-surveyed population . Indeed, in our residency program, residents are surveyed after every clinical rotation, and surveyed frequently as a part of innovative medical education research frequently performed at our institution. Survey fatigue likely contributed to the OIs response rate as well as the fact that many OIs have multiple other jobs and roles at the institution, including working at community affiliates, and may not be as invested in taking the time to complete a survey. Additionally, our hospital does not have critical care fellows or advanced practice providers in-house overnight, who may play a large role in overnight resident education at other institutions. Our findings illuminate a secondary benefit of 24/7 intensivist coverage, and the opportunity to tailor overnight education to residents' educational needs and learning preferences. Further research should be directed towards investigating the type of education provided by non-physician providers as many hospitals many not have OIs, promoting inter-professional teamwork, and characterizing peer-to-peer teaching occurring overnight. CP collected data for the study and drafted the work; AC assisted with statistical analysis; BR, AS and RS contributed to data interpretation, and revisions of the manuscript; All authors gave final approval to the submitted version and agree to be accountable for the integrity of the work. Checkley W, Martin GS, Brown SM, Chang SY, Dabbagh O, et al. (2014) Structure, process, and annual ICU mortality across 69 centers: United States critical illness and injury trials group critical illness outcomes study. Crit Care Med 42: 344-356. Haupt MT, Bekes CE, Brilli RJ, Carl LC, Gray AW, et al. (2003) Guidelines on critical care services and personnel: Recommendations based on a system of categorization of three levels of care. Crit Care Med 31: 2677-2683. Parshuram CS, Kirpalani H, Mehta S, Granton J, Cook D, et al. (2006) In-house, overnight physician staffing: A cross-sectional survey of Canadian adult and pediatric intensive care units. Crit Care Med 34: 1674-1678. Pronovost PJ, Angus DC, Dorman T, Robinson KA, Dremsizov TT, et al. (2002) Physician staffing patterns and clinical outcomes in critically ill patients: A systematic review. JAMA 288: 2151-2162. Kerlin MP, Adhikari NKJ, Rose L, Wilcox ME, Bellamy CJ, et al. (2017) An official American thoracic society systematic review: The effect of nighttime intensivist staffing on mortality and length of stay among intensive care unit patients. Am J Respir Crit Care Med 195: 383-393. Levy MM, Rapoport J, Lemeshow S, Chalfin DB, Phillips G, et al. (2008) Association between critical care physician management and patient mortality in the intensive care unit. Ann Intern Med 148: 801-809. Costa DK, Wallace DJ, Kahn JM (2015) The association between daytime intensivist physician staffing and mortality in the context of other ICU organizational practices: A multicenter cohort study. Crit Care Med 43: 2275-2282. Piquette D, Fowler RA, Slutsky AS (2010) Impact of intensivist staffing on patient care and trainee education: A Canadian perspective. Am J Respir Crit Care Med 182: 442-444. Diaz-Guzman E, Colbert CY, Mannino DM, Davenport DL, Arroliga AC (2012) 24/7 In-house intensivist coverage and fellowship education: A cross-sectional survey of academic medical centers in the United States. Chest 141: 959-966. Kerlin MP, Small DS, Cooney E, Fuchs BD, Bellini LM, et al. (2013) A randomized trial of nighttime physician staffing in an intensive care unit. N Engl J Med 368: 2201-2209. Garland A, Roberts D, Graff L (2012) Twenty-four-hour intensivist presence: A pilot study of effects on intensive care unit patients, families, doctors, and nurses. Am J Respir Crit Care Med 185: 738-743. 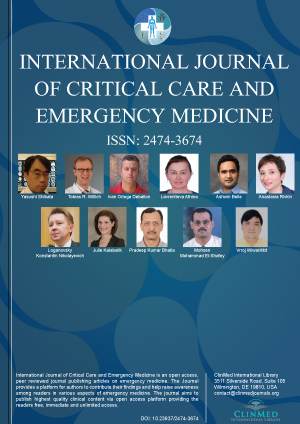 Almoosa KF, Goldenhar LM, Puchalski J, Ying J, Panos RJ (2010) Critical care education during internal medicine residency: A national survey. J Grad Med Educ 2: 555-561. Nishisaki A, Nguyen J, Colborn S, Watson C, Niles D, et al. (2011) Evaluation of multidisciplinary simulation training on clinical performance and team behavior during tracheal intubation procedures in a pediatric intensive care unit. Pediatr Crit Care Med 12: 406-414. (2017) Summary of changes to ACGME common program requirements section VI. Accreditation Council for Graduate Medical Education. Sabri N, Sun NZ, Cummings BA, Jayaraman D (2015) The perceived effect of duty hour restrictions on learning opportunities in the intensive care unit. J Grad Med Educ 7: 48-52. Zibrowski E, Crukley J, Malett J, Myers K (2016) To submit or not submit: The burden of evaluation on postgraduate medical trainees. MedEdPublish, 5. Camille R Petri, MD, Massachusetts General Hospital and Beth Israel Deaconess Medical Center Combined Fellowship in Pulmonary and Critical Care Medicine, Harvard Medical School, USA, 55 Fruit Street, Bullfinch-148, Boston, MA 02114, USA, Tel: 617-726-8854, Fax: 617-726-6878. © 2019 Petri CR, et al. This is an open-access article distributed under the terms of the Creative Commons Attribution License, which permits unrestricted use, distribution, and reproduction in any medium, provided the original author and source are credited.